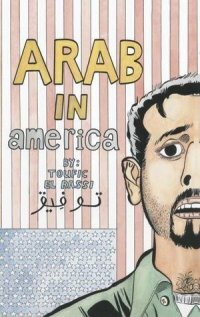 Arab in America is a graphic novel about Toufic El Rassi's experience... as an Arab in America. Interestingly, he doesn't begin only after the September 11th attacks- he goes back to the 80s and 90s, with the Israeli attacks on Lebanon and the Gulf War and discusses how these events have impacted the way Arabs are treated in the US. In many respects, this was a depressing read. It seems that no one El Rassi has met in the US truly understands him, and he feels very isolated because of it. This is particularly disheartening because El Rassi has lived in the US since he was a year old- and yet, he still doesn't feel welcome in the culture here. The graphics in this book are alright. All the panels are in black and white, but they didn't particularly grab me. El Rassi states that he used to be very shy, and then as he became more secure in his background and his culture, he was more comfortable speaking out about his feelings. I think you can see that confidence in his drawings, but I also don't think he is much of an artist by trade- the words are more important to him. This isn't a man who is uncomfortable talking about important topics. He confronts them and calls you out on them and forces you to consider your own actions. I often feel most people in the western world don't really care about the variations between different subcultures. For example, they'll use the term "Indian" to refer to anyone who looks a certain way, ignoring that there are multiple countries on the subcontinent. And then people will assume that everyone from India is Hindu. Or, now, that everyone with brown skin is Muslim. Or that all the different tribes that used to populate America now fit under the general banner of "Native American." In some ways, it's understandable- it is very easy to group people different than yourself into an all-encompassing "other" category until you have reason to care enough to get things right. But in other ways, it's not okay at all. Ignoring the variations in definitions or pronunciations of words implies to another person that she does not matter enough for you to get it right. This happens to me all the time, to a less horrifying extent, with the pronunciation of my name. I will say it, and inevitably, it is mispronounced. I will correct the person, and she will again mispronounce it. And then will keep mispronouncing it, often with an excuse like, "Oh, I'm probably just going to forget, but I don't mean any offense." But really... how is it not offensive to continuously (and knowingly) mispronounce someone's name? I pronounce other people's names correctly, and I don't think it's asking too much for them to pronounce mine the way that my parents meant it to be pronounced. This is a point that El Rassi brings up in his narrative. For example, he finds it grating on the ears that Americans pronounce Iraq as "Eye-RACK," when that is wrong. How can you go in and claim to be restructuring a country, he asks, when you don't even know how to pronounce its name correctly? When you don't even respect the people or the culture enough to try to pronounce it correctly? No one does, not regular people on the street, not the generals fighting the war, not the President. That sends a message, loud and clear. A particularly moving scene is when El Rassi is seated next to a Sikh man on a train. Two other men get on the train and begin to taunt the Sikh man, saying that he is a Muslim terrorist. 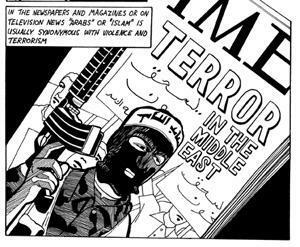 El Rassi wants to help him, but is paralyzed by fear that he will also be called a terrorist. Or, worse yet, incite them to violence. So instead, he sat and did nothing to defend the man, something he still feels immense guilt for. And that sends a message, too. As do all the movies that portray Arabs in them, not least of which is Star Wars. And the newspapers and magazine articles. Always, there are stereotypes. As El Rassi points out, almost all information about Arab cultures and countries that Americans get is filtered through white American eyes or prejudices first. Arabs do not have their own voice in American society- they are always interpreted through other people. All this serves to make people, even those who live and are brought up here, to feel isolated and unwelcome. I admit, this is where El Rassi kind of lost me. I personally have never felt unwelcome in the US due to my skin color. I have never felt that I don't fit into the culture or that people don't understand me. (El Rassi's experience particularly startled me because much of his story takes place in the Chicago area.) Granted, he was in school about ten years before me, but I just can't imagine that his experience was that markedly different than mine. I'm not saying that he's lying, I am just saying that my personal experience growing up in the Chicago area never made me feel as isolated as his did. That said, though, I also grew up with a lot of Indian people around me and perhaps El Rassi did not have that support system. However, just like El Rassi, I very clearly remember the first time I realized I was "not white." Or that I was different than most other people around me. I think most people of color have strong memories associated with those moments of "other-ness," and I wish that El Rassi had had people around him with whom he could share his feelings. 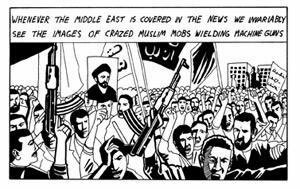 Arab in America is as much a political commentary as it is a memoir. El Rassi points out all the illegal searches and morally ambiguous things the US has done to people of Arab or Muslim origin, almost always without justification. He says that he is terrified of being sent to to the Middle East, where he does not understand the language or the culture. But at the same time, he doesn't feel at home in the US, either. It sounds like a miserable, lonely, and horrible position to be in and it's impossible not to empathize with his situation. In many ways, it felt like this book was written just to get the frustration and sense of impotence off his chest, and feel that he has done something worthwhile. He points out many hypocrisies (including his own) and really forces open your eyes on many different subjects. I am glad I read this book, but at the same time... I am not sure if the people who should read this book are the ones that will read it. I think its audience is self-selective, and I'm sorry for that because there are hard lessons here to be learned. >>This is a point that El Rassi brings up in his narrative. For example, he finds it grating on the ears that Americans pronounce Iraq as "Eye-RACK," when that is wrong. How can you go in and claim to be restructuring a country, he asks, when you don't even know how to pronounce its name correctly? When you don't even respect the people or the culture enough to try to pronounce it correctly? This bit made me pause a little (even though I don't pronounce Iraq that way, and I think it sounds quite grating too just from an aesthetic pov), because it seems to be conflating language with knowledge...native English speakers are likely to pronounce lots of things differently from native Arabic speakers. I can completely understand the personal name thing, but with countries or cities, I hesitate more...after all, we say 'Russia' while Russians call their country 'Rossiya,' but I'm not sure one would call someone insular because of that. That being said, I'm still definitely interested in reading this. I've been thinking about these kinds of issues lately while attempting to figure out how to talk about a book I read, Memories of Muhammad. I definitely would like to read this one! As a minority myself (hearing-impaired)and experiencing that sense of not always feeling accepted, I really do feel that the "majority" -- at least here in the US -- tends to treat female minorities more kindly than male minorities. The only reason I can think of is that minority males are perceived as more of a threat; taking over the male majority's jobs, women, etc. I happen to agree with him on the eye-rack thing. And eye-talian while we're at it. To me it definitely sounds like a subtly crass way of showing disrespect. I also agree that the media is awful when it comes to people in the Arab world, especially Disney. To give very young impressionable children those unspoken cues is just criminal, in my opinion. You are lucky to have grown up in Chicago but I think it is 180 degrees from many whitebread communities all over the country. I think it's great that he wrote this book to express himself and his feelings. It seems like a constructive approach to feelings of isolation and alienation. But I too wish he had more people around him around whom he would not feel so different and alone. Thanks for pointing that out, though! Made me think. Valerie- That is a good point and not one that I ever considered! Perhaps it does have more to do with gender, which puts a very different spin on the whole situation. Particularly here, if it brings up feelings of patriotism and jobs being lost to foreigners, etc. Thanks for that insight. rhapsody- I agree completely about Disney! I remember when they were made to change the lyrics to Arabian Nights because originally they said something like, "Where they cut off your nose (?) if they don't like your face/It's barbaric, but hey! it's home." And El Rassi brings up a lot of other movies, too. It's criminal, really. And he points out that it implies an implicit acceptance of racism towards Arabs, even though racism against others is generally frowned upon in the US. Hm, how is Iraq said then? Cos I do say it the Swedish way, like...Iraak, kind of. Anyway that first comment made me think, cos then everyone in the entire world says Finland the wrong way, it's actually Suomi. But some great points there, and I am sure I would have no idea how to say your name. Give me a hint here :) Cos your name has this kind of Finnish feel of it so I tend to pronounce things like that Finnish, even if it's not my language, confusing. One more point, what really bugs me is the people they sometimes have playing Muslims. lately I have seen people who I have seen that are not Arabs. So I check, and lately they have been Latino, maori, you name it. It's like the put all people with browner skin together. Do people not see the difference? The way people pronounce certain words is not merely a cross-country issue. Even in India, with different languages, people tend to pronounce names differently. My name is pronounced differently by North Indians and South Indians in spite of correcting them a hundred times. Similarly Bengalis, Gujaratis pronounce my name differently. I don't take that as disrespect. That said you have written an excellent review and I will definitely check this book out. Wow, great review. This sounds like a book that I should really find, a lot of issues covered that I enjoy reading about. Too bad the graphics are only alright, but I'm glad the story itself was good. The variations between different subcultures is something I've often noticed. This is my first time to visit this blog and I was so surprised in what I saw. This review is so amazing. From now on I am going to visit this blog every week. This definitely sounds like one I might want to read (though who wants to bet my library won't have it?). Interestingly, I remember the first time I realized I wasn't black. I was 10 at the time. Blodeuedd- I believe the correct pronunciation is "ee-raak." I agree that a lot of times, they'll just put any brown-skinned person into a movie to play someone else. M. Night Shyamalan himself did that in Last Airbender, and he is brown-skinned. Violet- If you don't take it as disrespect, then why do you correct them hundreds of times? I still think that if you pronounce your name a certain way, and tell others that that is how you say it, then they should say it that way, too. At least, the people who matter should. Not telemarketers, perhaps. Amanda- That IS interesting. I was 8 when I had my first "culture" wake-up and then 12 when I had my first "skin color" wake-up. I agree with you on so many levels with this post, but I also agree with Eva about pronunciation - and not just with countries. For example, my name is Trisha, but I have a friend who calls me "tuh-reesha". It's not a form of disrespect; it's merely accent. In her native tongue, a "t" and an "r" would never be pronounced in unison and the syllable "ish" is pronounced "eesh". I hope you don't think I'm being rude by disagreeing. I recognize the difference is that some white people seem to think that it's no big deal they can't pronounce your name - or they expect you to "Americanize" the pronunciation by which they mean "make it sound like Bob". It's the attitude that makes all the difference. I think that it's a terrible thing for so many people of other cultures to have to be made to feel less than by Americans, and I agree with you, that is is not only hatred that they face, but also disrespect. I can't imagine feeling like I don't belong in a place I have lived in for my entire life, and it does sound like El Rassi is really isolated not only by the way others treat him, but by the way he views himself. I also think that this book should be widely read, but agree that the people who do need to read it probably won't pick it up. It's sad to know that this happens and that whole segments of the population are alienated in this way. Oh, and the consistent mispronunciation of my name would probably drive me crazy and make me very angry as well! Trisha- I don't think you're being rude at all. But I also think it's different if it's difficult/impossible for someone to say your name correctly- for example, people from England can't say my name correctly because the R is very difficult for them to say at the end of a syllable. I think the same may be true for your friend, who can't put the letters T and R next to each other. However, for my name... I grew up in the US and have a pretty strong American accent, so if I can say my name correctly, so can everyone else here. I am not saying every random telemarketer has to say it properly the first time, but if you are someone that I am close to or interact with regularly, I think the name should be pronounced as close to the correct way as possible. Zibilee- You're very right. I do think El Rassi isolates himself as well as feeling isolated by others. He says that he is shy and hangs back and so maybe that comes across as stand-offish to others. He could be hard to warm to, but I suppose that isn't really the point. It IS sad to feel as though you don't belong anywhere. Aarti - so how *do* you pronounce your name? I kind of drag it out, more or less "Are-tea" with the 'are' part pronounced, well, piratically. I tend to pronounce phonetically though. I've read more words than I've heard, I think. While I tend to think El Rassi sounds excessively thin skinned - I'm half blind & cross eyed because of it and have heard my share of horrifying statements - I have heard Iraq pronounced I-rack by people who really ought to know better. OTOH, is it a class thing? Excellent review, Aarti, and a great discussion going on in the comments. I think I agree with you on the pronunciation issue, but I can see the other side too. I guess there's a different in not being able to pronounce a sound and not bothering to get it right, and sadly the first is probably often used to cover up for the second. Also, I love this bit: "Ignoring the variations in definitions or pronunciations of words implies to another person that she does not matter enough for you to get it right." So true. Amy- I just realized I never responded to you! I think the subculture thing is more nuanced (much like my comments on Bengali vs. Indian in a previous review), and hard to catch onto unless one is familiar with a culture. So it's understandable, but... not if you are an expert in the area. And I don't know if I'd say El Rassi as much thin-skinned as he is very sensitive. He mentions how he doesn't like to participate in protests or sit-ins or anything of the like because of the connotations people will inevitably attribute to him. I think when you have to be that AWARE of all your decisions, then you become more sensitive. Nymeth- I can see the other side, too, and I don't think I'm doing a good job of explaining why I think there is a hierarchy of reasons in why people mispronounce things. I like that you like that! lol. Oooh, the "thee" pronunciation makes it sound absolutely beautiful. It grates on my ears every time I hear someone pronounce Iraq that way. I'm not asking anyone to do the initial consonant or the back-of-the-throat K sound, but a short i and a long a are both sounds we have in English. When we anglicize names of countries, like Spain or Russia, we're doing something closer to translating, whereas "Iraq" isn't a case like that; it's a transliteration of the Arabic. Meeting it halfway isn't that much to ask. Weighing in on the pronunciation thing: Sometimes people can't hear the difference between what they're saying and what you're telling them to say; or they can hear the difference and can't reproduce it. (Not you particularly, the editorial you.) I'm thinking of my sister, who always says things like "I know I'm going to say it wrong". She doesn't mean she can't be bothered getting it right, she means (she's terrible at names anyway and) she can't figure out why she's getting it wrong and consequently suspects she will get it wrong again next time. Good point Aarti. It's definitely about attitude - it's like some people think they don't have to try. I recognize your frustration about name pronounciation. I have a "normal" Dutch surname, but somehow everyone who I meet turns it into a German-like surname. Even if I go up to them, tell them my name, they will always use the different and wrong pronounciation afterwards. And I never got that, I go up to them and tell them and one second later you just forget it? Ask anyone I know and they'll tell you how frustrated I am by it. But I have sort of given up on correcting people all the time, I figured it was hopeless. Aha, so that is how one should say Iraq, I tried it and it sounds like I have this heavy Swedish countrydialect, lol. But it fits my tongue perfectly. I saw what you had written about your name too, and I don't think that would be a problem here, RT works perfectly together. We should no, no one pronounces Finnish names right. I love this post, and the discussion in the comments is just as good. I would definitely like to read this book -- I wonder if there's any chance my library would have it? Graphics help depict the emotion behind a serious problematic stereotype. Loved it, enjoyed it and there should be more graphic biographies similar to this one.